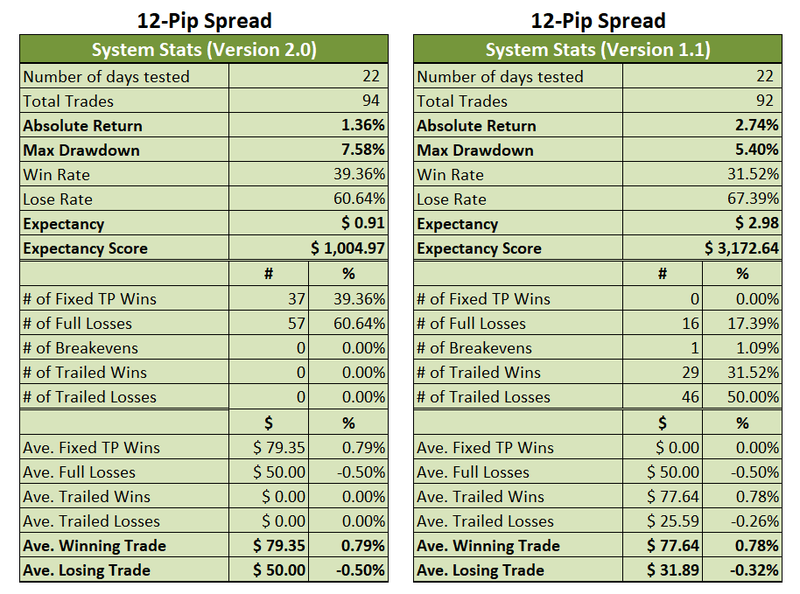 If you can still recall, I presented Version 1.0 of my prototype trading system last week. And back then, I showed that the system worked on paper since it had positive expectancy and raked in 9.72% worth of gains after 92 trades in 22 days. 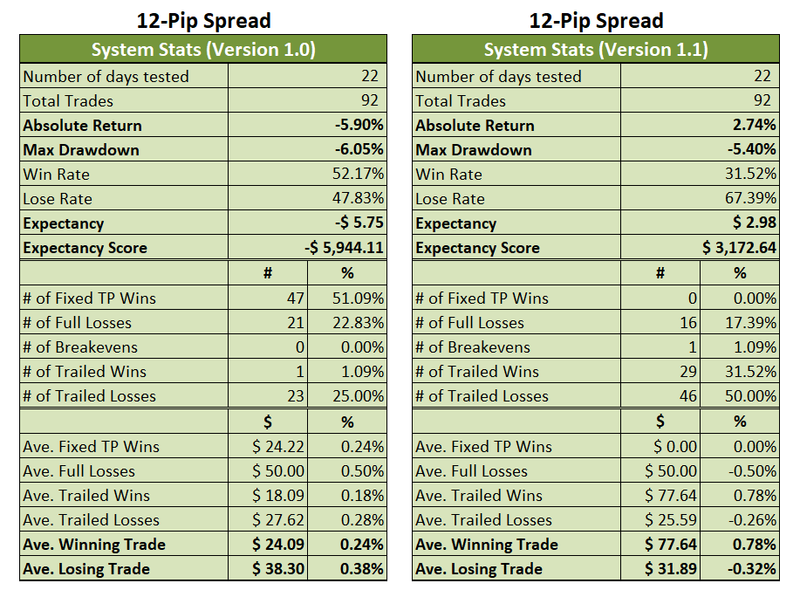 However, I also applied real world conditions by assuming a fixed 12-pip spread. And, well, the system ended up being a failure, printing a loss 5.29% after 92 trades in 22 days. I therefore resolved last week to find a way to let my profits run. And alternatively, I thought about trying to find the optimum fixed profit target in order to mitigate the negative effect of GBP/NZD’s high spread on the trading system’s profitability. And to those ends (particularly the former), I developed Version 1.1, which is basically Version 1.0 but without a fixed TP, allowing the trailing rules to do their magic. And it looks like the trailing rules I developed are indeed magical since Version 1.1 yielded positive returns and expectancy. Cyber high five! However, I also attempted to find the optimal fixed TP target, which is what Version 2.0 is all about. Unfortunately, I wasn’t able to finish it, but I did leave a preview below, if you’re interested. 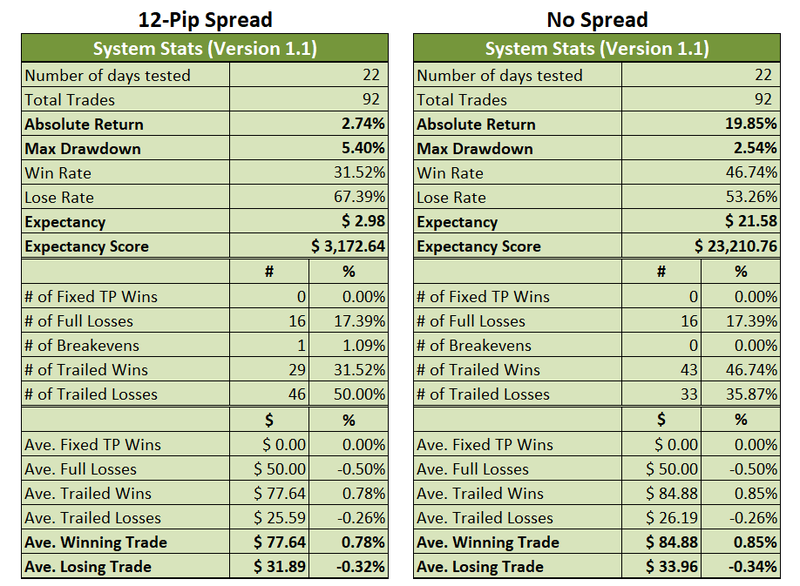 And yes, Version 2.0 is also profitable, despite the painful 12-fix spread. But before I discuss the trading systems, I would like to start by devoting a portion of today’s write-up on spreads and their “hidden costs” so to speak, so that newbies can understand why Version 1.0 went from a potential money-making machine into a disastrous money sink when we simply took a fixed 12-pip spread into account. And hopefully the newbies out there will take spreads more seriously into consideration when they trade. But if you’re in a hurry, then you can always click on the topic of your choice below. I mentioned in My 2018 Trading Resolution that the higher spread on GBP/NZD likely won’t be that big of a problem. And boy, oh boy, am I second guessing myself now. Anyhow, if you’re wondering why taking a spread of 12 pips into account turned Version 1.0 into a failed system, then that’s what this portion is all about, so huddle up! Okay, let’s assume that we are going long on GBP/NZD and that our entry price is at 1.7600. 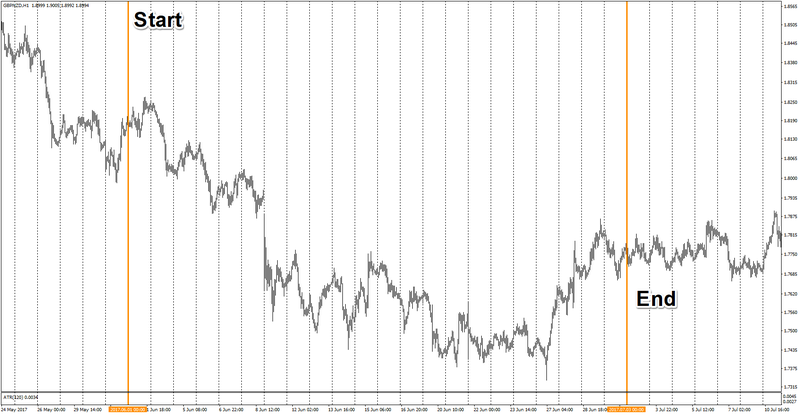 Now, let’s assume that our stop loss (SL) is 50 pips away at 1.7550 (1.7600 – 0.0050). Let’s now also assume that we want to maintain our reward-to-risk ratio at 1:1, which means that for every 1 pip we risk, we expect to gain another 1 pip. And since we risk 50 pips, that means we also expect to get 50 pips, so our target profit (TP) is at 1.7650 (1.7600 + 0.0050). Pretty simple, right? Here’s a quick review. Okay, let’s now take spread into account. Since we are going long, we add 12 pips to our entry price, so our new entry is no longer 1.7600, but 1.7612. However, our TP and SL are unchanged and our reward-to-risk ratio is actually no longer 1:1. See the difference? 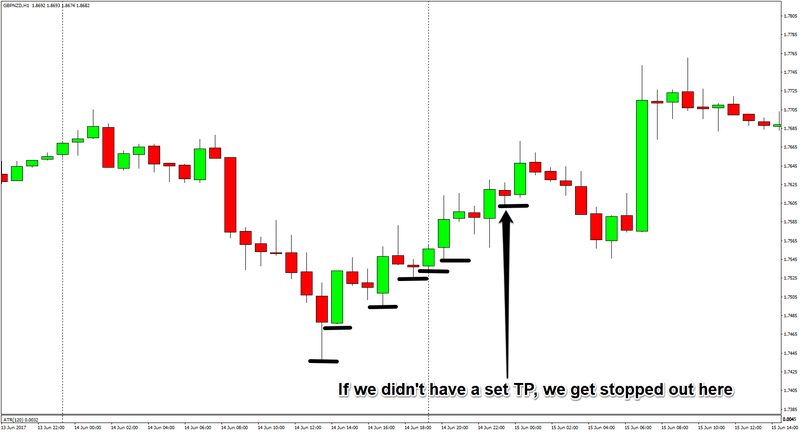 Our TP is now 24% smaller at 38 pips while our SL ballooned by 24% to 62 pips. And that’s why the effect of the 12-pip spread on Version 1.0’s performance was so devastating because Version 1.0’s +50% hit rate was just not enough to overcome the low reward-to-risk ratio. Version 1.0 generated 92 trades in 22 days. Each trade gives up 12 pips to the broker, which means that I lost a grand total of *gasp* 1,104 pips (92 trades multiplied by 12 pips spread) in 22 days to spread. Mama mia! No wonder Version 1.0 quickly became a loser! Anyhow, spread is less of a factor for longer-term traders who shoot for several 100’s of pips. But for my short-term trading system that relies on multiple trades per day, it’s actually a really big hurdle… more so than I originally anticipated. Thankfully, there have been some promising developments. I mentioned last week that I was planning to remove the TP level from Version 1.0 and just let the trailing stop method do its magic. Well, I did just that with Version 1.1 and here are the results. Anyhow, Version 1.1 is clearly superior in terms of absolute return and expectancy. However, it does come at the cost of win rate since Version 1.1 only has a win rate of 31.52% versus Version 1.0’s impressive 52.17%. Version 1.1 really excels whenever GBP/NZD is trending and it does well enough if trends last at least for two days. However, Version 1.1 very quickly bleeds out whenever GBP/NZD traded sideways for a prolonged period. Version 1.1 is also very vulnerable to false signals or getting prematurely kicked out of a profitable trade when there is high intraday volatility, such as during the first few days and last few days of June. I specifically chose that testing period because of the abnormally low daily volatility, heavy intraday volatility, and range-bound price action near the end in order to see if the system will survive. And while the system did survive, I still want to reduce the peak-to-trough drawdown if possible. So there is certainly still room for improvement. And I guess it’s just trivia at this point, but here’s how the system would have fared without spreads. Man, just look at the difference in stats! Without spread, the system would have generated a return of 19.85% in just 22 days. But with a 12-pip spread, we only get 2.74%. That’s just so sad! Also note the win rate. If there are no spreads, then we get more trailed wins, but because of the 12-pip spread, some of those small wins ended up becoming small losses instead, messing up our win rate in the process. Maybe one solution to improve profitability is to look for a fixed spread broker with spreads lower than 12 on GBP/NZD? Haha! By the way, the rules are pretty much the same as Version 1.0, so I wouldn’t be explaining them anymore. So check out Version 1.0 out if you somehow missed it and need examples and explanations. We no longer have a TP, so TP is scratched off our list of definitions. And I scratched off everything else related to the TP below. As I mentioned earlier, I’ve also been working on finding the optimal fixed TP. 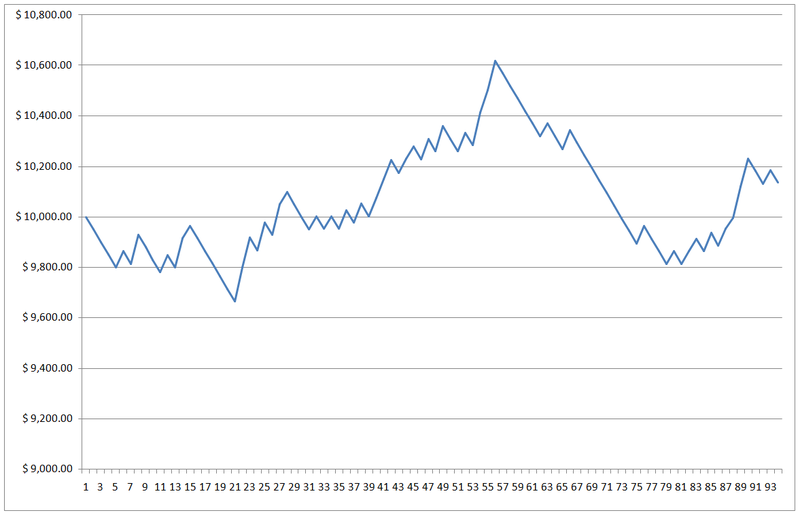 And while it’s not complete yet, I do have some promising preliminary results. Looking at the stats above, it’s quite obvious that Version 2.0 has no trailing rules yet, so it’s either a hit or miss whenever a trade is opened. And stats-wise, Version 1.1 looks superior. However, I’m more interested in the equity curve. 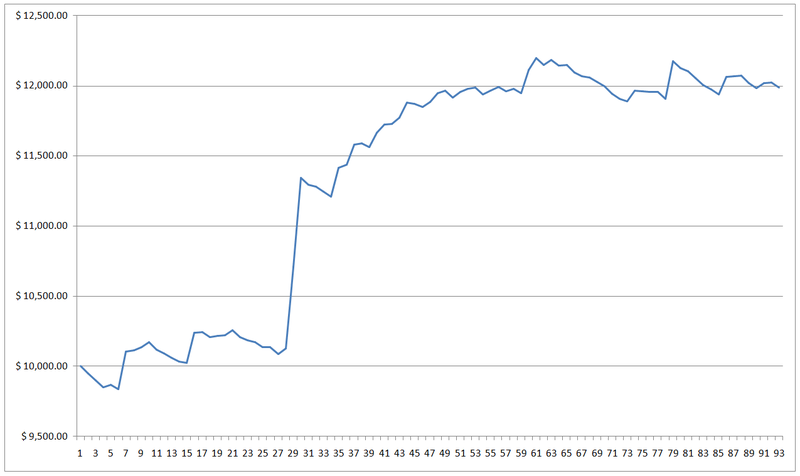 As you can see above, Version 2.0’s equity curve began to tilt to the upside near the end. 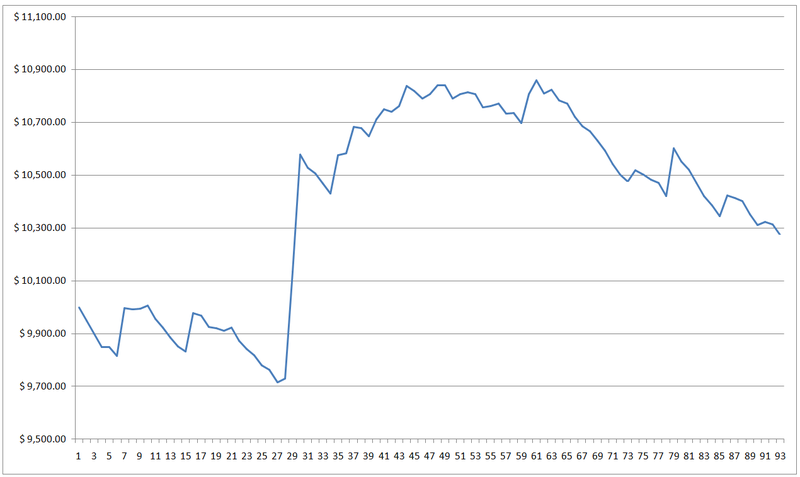 In contrast, Version 1.1’s equity curve took a dive from taking several hits. And that, in my opinion, is a sign of a more reliable system. Of course, I have to iron out the kinks first, so look forward to it next week!